Ratchet is a very well-known tool among automotive, engineering or almost all mechanical applications. It is a must to have tool for screwing or adjusting nuts or bolts with ease and perfection. Not to mention, these tools are quite advantageous that can help you to loosen or tighten the nuts which you can’t do using common wrenches. So, now, you may understand when to use a ratchet vs wrench. The 3/8” ratchets are the most common as it fits on most of the typical nuts and bolts. To enjoy an effortlessly perfect and quick wrenching, you should have a good 3/8 ratchet. And to help you avoid the troublesome searching for the ultimate one, we got the 10 best 3/8 ratchets you need to check out. This GearWrench ratchet set from Apex Tool comes with a set of perfect gears to apply the turning forces. From construction to finish, the best 3/8 flex head ratchet set is capable of turning the threaded fastener with much ease and comfort. Through the flex head, you can easily reach tight places. Not to mention, the head is adjustable which encourages better reach. In fact, the 6-position adjustment induces a better clearance allowing you to get further accessibility. The 120xP gives 120 possible positions for each full turn. Again, there comes a 3° super-tight arc which can turn the bolt where the others can’t even reach. The 2-drive set can provide superior ASME torque performance to get your job done. With the included ¼” and 3/8” drives, you can take care of almost all typical threaded fasteners without the slightest trouble for sure. Being available in an affordable price, this is indeed the best 3/8 corded ratchet. Ratcheting pack includes 1/4'” and 3/8” sized drive. Tighter confining with 120-position for fastener turning. Double stack pawls induce 180% ASME torque speed. Convenient storage with the high-quality foamed tray. 3-Degree swinging arc encourages super-tight turning. Poor shape of the cosmetic may seem odd. The head doesn’t come with a locking mechanism. This versatile Tekton 3/8 ratchet is another option from our top picks to fulfill your needs. Providing a quicker release for the nuts, this best composite ratchet is beefy and sturdy enough to take the load. The head and handle assembly are of chrome vanadium steel which imparts incredible toughness. Along with the impact resisting composite polymer shell over the assembly, it prevents possible scratching for the finished portion. Thus the design makes it highly suitable for colder temperature. With 72-teeth oval head construction, you only need a 5-degree swinging arc to make it work. Not to mention, you can easily drive and change the direction with a single flick over the thumb switch. Through the sufficiently larger offset handle, you will enjoy a better and extra space for finger movements. Preventing any sort of scraped knuckles, you will get no safer option to turn the bolt than this best 3/8 ratchet wrench. The 72-teeth oval head can give a perfect 5° swinging arc. Heat treated chrome vanadium steel construction. Impact resistant composite shell suits colder temperature. Extra clearance for the fingers through the offset handle. Resists marring and scratching for the finished portion. The ratchet may snap due to sudden heavy loads. Backward direction lever may cause difficulty. This is another outstanding product of GearWrench brand to get you an effective socket wrenching. Being a new and improvised tool, it comes with better strength along with greater accessibility to turn the ratchet. Along with the head, you can have greater accessibility in tight spaces. Needless to say, this teardrop ratchet requires less lateral space providing a tighter confinement. And for limited space, it is capable of quiet and smooth working just as you want. For professional applications, it comes with 20% greater accessibility than its competitors. The 3/8” drive ratchet contains 84 teeth which makes it more effective for sensitive works. Of course, the 4.3° swinging arc will lessen your effort in turning the bolt for sure. Included flush-mounted lever induces quick release as it allows you to trigger the on/off switch within no time. The fine tooth gear decreases the arc from 6 to 4.3 degree which gets you better performance with this best professional 3/8 ratchet. 180% of ASME torque performance with 84 teeth design. Adjustable flex head comes with handle locking system. Better visibility along with bright, silver chromed finishing. The long built-in handle provides greater accessibility. Teardrop shaped head can provide 4.3° ratcheting arc. Minor slip or jump for the teeth can occur. No button for socket release. Tekton gets here another similar creation like its previous ratchet to induce a best socket wrenching. This swiveling product contains a quick releasing mechanism to offer a better performance when it comes to wrenching at narrow spaces. Along with 72-teeth with round head ratchet, you only need a 5-degree swinging arc to make the turning. Needless to say, you can easily drive and also, change the direction with a single flick. The assembly of the head with the handle is made of quality chromed molybdenum steel. The steel is forged and heat treated which imparts smoothness for the entire frame. Apart from that, the moulded handle allows you to make a comfortable handling with enhanced clearances thanks to the soft grips.Additional push button with lockable function encourages safety resisting typical socket drops. 270° smooth swiveling for all possible driving angles. Rounded head delivers a tight 5-degree swinging arc. Heat threaded chromed molybdenum steel construction. Corrosion & moisture resisting chrome plate finishing. Effortless operation with non-slipping soft gripped handle. The swiveling head requires muscle to make the turning. Holding the head while working may pinch your hand. Along with its superior construction, you will surely get one of the best 3/8 ratchets for sockets. In fact, Stanley produces a great tool with outstanding features to meet the ANSI specifications. Through high-quality forged steel makes it reactionless air ratchet and the frame is able to withstand the heavy turning load and great torque speed. Of course, it imparts greater strength which makes it more durable against prolonged applications than its suitable substitutes. Apart from that, the chromium polished finishing induces better resistance against corrosion. The ergonomically designed handle is long enough to reach tight spaces. The easy-to-use handle also comes with a reverse switching mechanism which is thumbed operated. With a 7-degree swinging arc, this suits certain nuts and bolts, yet provides excellent turning performance. This 3/8 drive comes with a reduced lateral construction that gives a slim profile for the tool. Through the profile, you will enjoy a much better accessibility with this one. High-quality forged steel offers better serviceability. Ergonomic ratchet handle has a reverse switching facility. High-polished chrome finishing offers protection. Sufficient accessibility through a 7-degree swinging arc. Single pawl along with 8 teeth delivers strength for gear. Direction selector in narrow space may cause problems. Certain users can find the tool a bit unbalanced. With an adaptive design and construction, this tool can deliver a rather fast ratcheting action. Having a user-friendly quick-release mechanism, this creation from Craftsman is ready to provide the perfect service anywhere. The ratchet is designed to withstand hundreds or wrenching jobs thanks to its rugged construction. Not to mention, the hardened alloy steel construction is capable of handling the toughest turning through its incredible strength. Again, the nickel-chrome finishing on the exterior makes it sturdy enough to resist possible weather actions. This one features a precise machining to ensure a solid connection with satisfactory longevity with further attachments. The thumb-operated directional switch over the handle allows an easy swapping between the sockets. And to deal with limited swinging, the ratchet comes with a 10-degree arc to encourage the accessibility. Needless to say, it may have limited applications but will meet your requirements within a reasonable time. Tough construction with high-quality forged alloy steel. Constant contact with a fastener through the reverse button. Teardrop shaped head allows accessibility for tight spaces. Minimized friction with less marrying over wrenching surfaces. Easy swapping between sockets with quick release button. Coarser teeth can require frequent socket holding. The gear may strip out due to high impact loads. With an ultra-small head, this unique product delivers higher accessibility than most other ratchets. Though Wera gets a 3/8” ratchets for you, it seems like a ¼” one in service which will allow making the wrenching much easy for sure. Through polished alloy steel construction, it can withstand the toughest loading for the sockets. Though the steel is sensitive to heavy impact loads, yet it delivers extreme tolerance for greater torques. Also, the high-quality steel introduces further durability for the product. Not to mention, the polished chromium plating over the surface induces better protection against weather actions. The bright, metallic silver appearance gives a better visibility which provides further clearance to work in tight places. The reversible switch lever induces better customization for the tool while turning the threaded bolts. With an ergonomic handle, the working becomes easy and fast which will satisfy your demands within no time. High-quality alloy steel frame induces better performance. Bright metallic silver outlook provides greater visibility. Lightweight with proper length allows further accessibility. Incredibly smaller head offers an effortless operation. Two different positions to lock the spinning ratchet. No adjustment facility for the head is available. Snapping may occur due to poor handling. This unique creation of Dewalt is indeed a great tool to give a perfect service for your socket wrenching problems.This best socket ratchet includes a versatile quick-releasing mechanism that allows the user to operate with further safety and comfort all the time. You only need a 5-degree swinging arc to make the turning along with the 72-teeth oval head construction. Again, the handle comes with one switch to trigger the directional driving. The mainframe assembly is made of high-quality chromed vanadium alloy steel. The forged steel is also heat treated to ensure maximum strength and capacity. Using the reasonably longer handle that contains a non-slipping grip, you will reach tight spaces with utmost ease for sure. Superior construction and user-friendly design make this a great choice to turn your tightened nuts and bolts. The slim head designation allows easy maneuverability. Heavy-duty chrome vanadium steel construction. 5-degree arc swing for the head offers better accessibility. Ergonomic handle design provides greater handling. Low profiled lever determines directional operation. The drive head can break off due to heavy impacts. Handle is not very smooth for comfortable gripping. Another similar ratchet that shares almost the same features as the previous one is this Crescent production.The combination of suitable features along with advanced surface drive technique can deliver a perfect solution to your socket wrenching problems. The entire head and handle assembly of this best 3/8 ratchet comes withquality chromed vanadium steel construction. Therefore, you will surely receive a tough tool to work with. Not to mention, the construction delivers sufficient strength which can withstanda considerable amount of loads. Again, there are lockable push buttons which help to attain a consistent loading and torque speed. It is true that is may not handle heavy impact load, but it is capable of giving you a much better result for moderate wrenching problems. Superior chromed vanadium alloy steel construction. Exterior polished finishing reduces moisture action. 5-degree swinging arc induces greater accessibility. The slim head contains 72 teeth to handle heavy loads. Perfect design meets all ANSI loading specifications. The directional flipper is quite rough to press. Not suitable for heavy ratcheting application. Though this incredible ratchet set from Powerbuilt offers a perfect set of gears to apply the heavy turning loads. The ratchet set is capable of turning the threaded fastener through its superior construction and ergonomic design with much ease. Containing 72 teeth for the head, it induces several suitable positions for every complete turn. Again, there comes super-tight 5-degree swinging arc to turn the bolt with maximum efficiency. Not to mention, the greater rotating movement is possible for this tool to allow a quicker wrenching. You can easily reach tight places with the flex head. Apart from that, the head is sufficiently adjustable to induce further reaching. Along with the precise adjustment, you will get a better clearance to ensure further accessibility for narrow spaces. The 2-drive set can deliver as far as 180% of ASME torque performance even at professional applications. Using the included ¼” and 3/8” drives, you can accurately take care of almost all common threaded fasteners with less effort. Stubby handle length easily reaches tight places. Maximum serviceability with chrome vanadium steel. Reversible ratcheting mechanism for 72 head teeth. Superior construction meets all ANSI specifications. Optimum strength to handle heavy torque speeds. Reverse lever position makes handling difficult. The ratchet may seem thick for certain spaces. You have to choose the best 3/8 ratchet which can provide a satisfactory wrenching service for your machines. But getting the best from too many available models seems a challenging take that will take hours. Knowing some important criteria about the ratchet will help you to avoid this hassle. Type of Wrenching: The very first thing you have to determine is for which type of nuts and bolts you want the ratchet. Also, you have to check out that what kind of narrow or tight space you have to deal with. Construction: Whatever the product is, construction determines the serviceability in most cases. For ratchets, alloy steel has no good alternative and you must check out the connection as well as the outlook. Length: Overall length of the head and handle assembly is important regarding accessibility. The higher the length, the greater will be your accessibility. But make sure that the head comes with a slim profile. Ratcheting Arc: The ratcheting arc is another important factor regarding accessibility. This one comes with a variable value for different models. 5-degree arc is the most preferred. Teeth Number: Teeth number on the head contributes to the smooth operation. The greater number of teeth will result in better performance. Mostly, 72 teeth hold good for almost all cases. The followings are simple guidelines to make the perfect use of the ratchet with your socket. Find the correct metric or imperial socket size according to the fastener. Line up the socket with the selected ratchet’s drive square for an attachment. Check out the turning direction whether you are turning rightward. Line up the heads of the socket and fastener by rotating them. Start rotating the ratchet handles in your desired direction. Swing the ratchet handle continuously in back and forth direction. Provide a bit forced to remove the socket from the designated fastener. There is some particular importance which makes the ratchet wrench a perfect element to take care of nuts, screws or bolts. To work at cramped spaces like engine bay and similar portions, ratchet wrench can be effectively applied due to their small size and robust construction. For working at warm or cold temperatures, insulated ratchets can be of great help. Full control over the tool is required to deal with wrenching problems and ratchets offer perfect handle grip to make sure of that. Flex heads make it easy to reach narrow spaces with ease and also provides some customization which can be attained through ratchet heads. We chose hundreds of models that come with quality assurance and popularity as well. Our vast analysis picked up the 10 best ones to offer that will certainly meet your demands. Therefore, each of the aforementioned 10 provides the best serviceability you can’t have from other models. 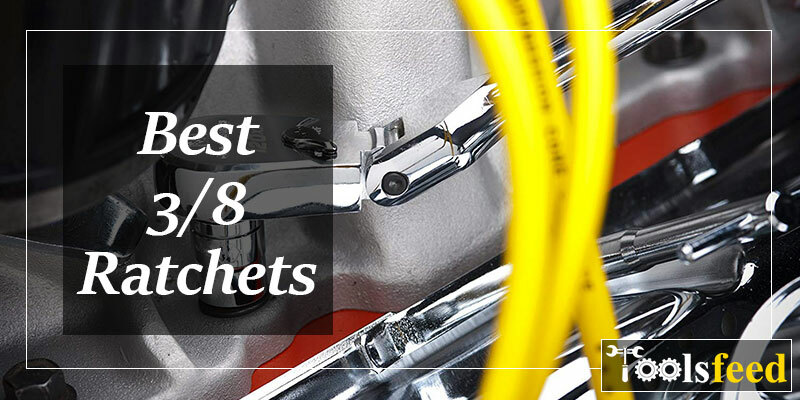 Our 10 best 3/8 ratchets have also high popularity due to their high-performing construction and design. We can assure you that each of our top picks comes with versatility and satisfaction regarding their price. The 7 Best Workbench Tops in 2019 : Choose Before Out of Stock!